If you follow this blog carefully, you already know I’m headed to Baltimore for this year’s National. Yes, I’m taking off work, oddly enough at a rather crucial time, because I want to be there all five days. I’ll be posting and tweeting with updates to create a mini virtual experience for those of you that can’t get there. More on that as we get closer. You also may have figured out I’m a life long Yankee fan. I accept your boos and your high fives. And to all of you Red Sox fans, I’m a decent person so, please, no hating. I’ll extend the same courtesy to you. There is so much to do and see at the National, so many things of interest to collectors. Over the next two weeks I will try to highlight some of the things I’m looking to forward to and booths I will be visiting. I’ve chosen Steiner Sports to profile first, largely because of their close association with the Yankees. They handle items from other teams too, even the Red Sox, so, again, please no hating. Steiner Sports is one of the heavy hitters in sports memorabilia. They carry autographed memorabilia by athletes like Hank Aaron, Joe Namath, Magic Johnson and Muhammad Ali and have exclusive deals with Derek Jeter, Tony Hawk, David Ortiz, Johnny Damon, Joe Torre, Eli Manning, Tiki Barber, Paul O’Neill and Curt Schilling among others. Through their Internet site, Steiner Sports handles sales and online auctions of rare one-of-a-kind collectibles. I’m really excited that one of these auction items will be at the National because the achievement associated with it happened on my birthday. Don Larsen’s perfect game uniform will be on display in the Steiner Sports booth in the corporate pavilion (A2D) Friday and Saturday. Don Larsen will be in the Steiner Sports booth from 12-2 on Saturday taking photos, meeting with fans and showing off the uniform. Right after Larsen’s appearance, Dwight “Doc” Gooden will signing autographs and be taking photos Saturday from 2-4pm, again at their booth. Autographs are free with any purchase during that time. There is a limit of 1 autograph per person. 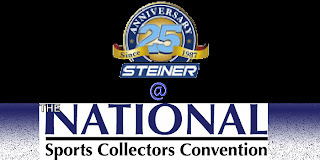 All five days there will be huge deals on Steiner Sports products at their booth with exclusive pricing to Baltimore. Some of the deals will at the lowest prices they’ve ever offered. Saturday is a busy day for Steiner Sports. Outside of their booth, at the Autograph Pavilion, two of their exclusive athletes will be signing. Soon to be the newest member of the Baseball Hall of Fame, Barry Larkin and one of my favorite players, MLB All-Time Saves Leader, Mariano Rivera will both be appearing to sign autographs courtesy of Steiner Sports. There is a fee for both of those signings. 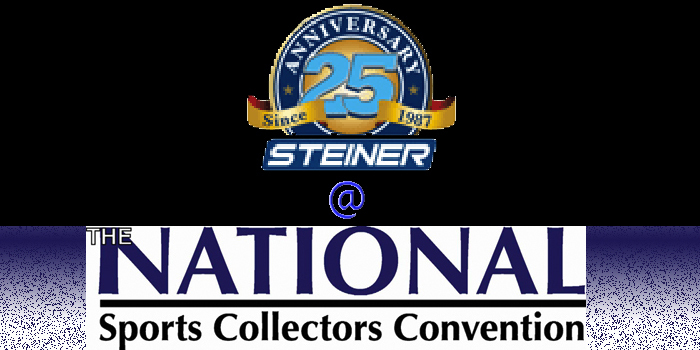 Steiner Sports events are not just confined to the Convention floor. On Friday night there will be an exclusive VIP party at Mosaic nightclub. Special guests include Hall of Famers Rickey Henderson & Barry Larkin with more to come. There will be a strict guest list only and because of the open bar from 7-9pm, this is an event for folks 21 & up. RSVP to Brooks Cowan at bcowan@steinersports.com. I’ll have more info on the National throughout the week.